What brought you to Kansas City? What makes you stay? I moved here in 2006 to be with my fiancé, John. I am originally from the Lake of the Ozarks area, and I feel that the move was a good choice as the jobs available there are significantly less, plus I would miss John, of course. ;) Now that I’ve lived here for over ten years, I find that I just love Kansas City. Original career plan: Graphic designer. I currently work at a call center for a bank as their Email Specialist full-time, and I have a lot of responsibilities. Jewelry design is what I do for fun, because I have that creative streak and because I really wanted to see some Art Nouveau and Art Deco pieces available for people to buy. 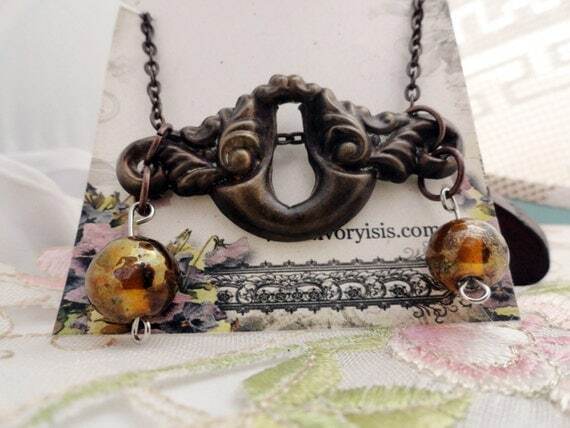 What do you make/when did you start: I make new jewelry out of vintage and recycled pieces. I actually started making jewelry around 1998, but stopped for several years. 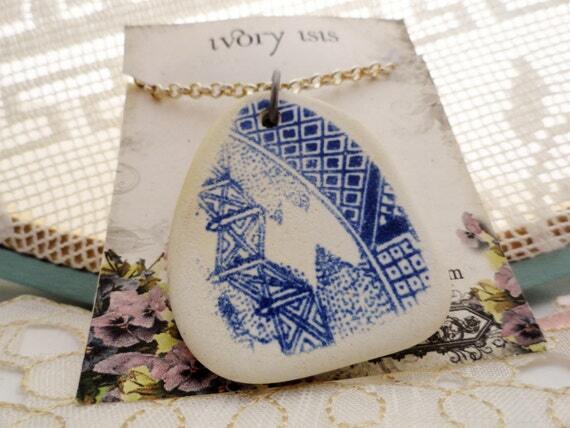 Ivory Isis began in 2013 officially. How did it move from just making to selling? Several of my friend encouraged me to at least open an Etsy shop when they saw my bottle cap necklaces, but when it didn’t do very well, I looked into selling at shops as well as craft shows. 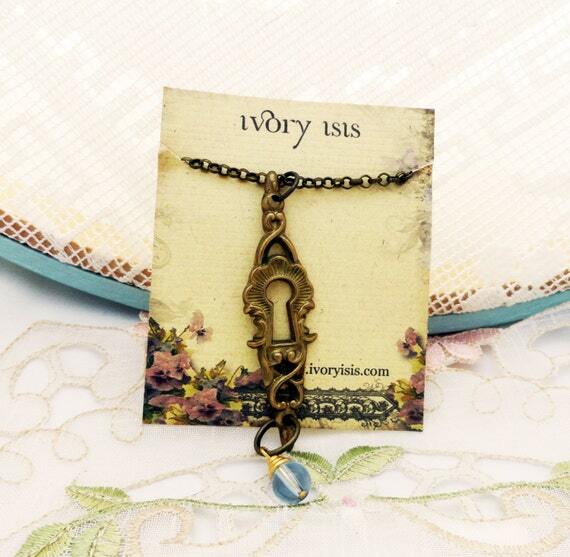 Story behind the name: Ivory Isis used to be my online nickname. I wanted my name online to be something to do with Isis, the Egyptian Goddess, because I love ancient Egypt. 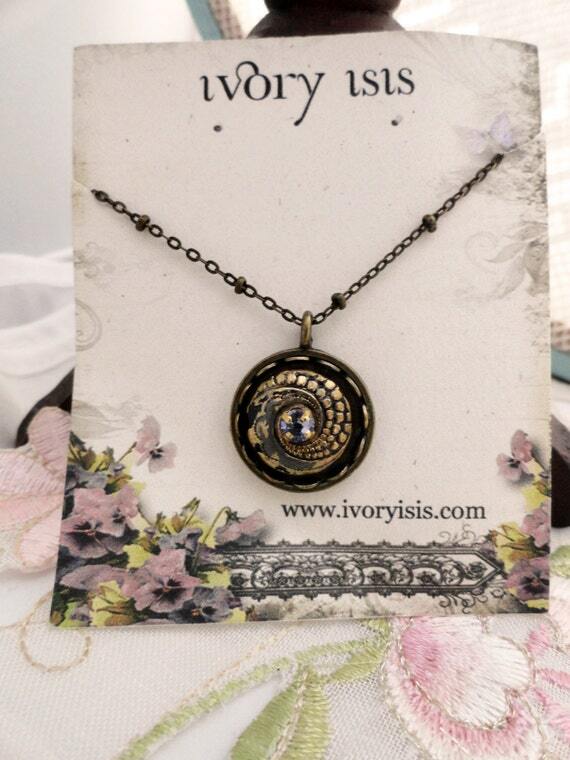 I chose ivory since it went well with Isis, and because I’m very pale. I tied that into the business because I resurrect old pieces of jewelry, like Isis resurrected her husband, Osiris, in the Egyptian myths. Tell me about your creative process: Usually I am just hunting for interesting pieces that I think I may be able to work with. For instance, at one point I found a large amount of old keyholes in an antique shop that I found to be a promising idea, and made a large amount of pieces from those, incorporating Swarovski crystals and other charms, such as hearts, to make each piece unique. 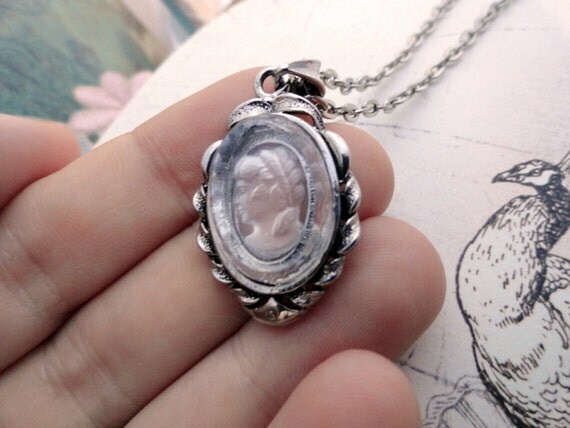 Sometimes I will actively hunt for pieces if I have a specific idea, like when I created button necklaces out of old Art Deco buttons and placed a Swarovski crystal in the center of each one. What is your inspiration? All of the old Art Nouveau jewelry designers, as well as Alphonse Mucha and any art or jewelry from the turn of the century. Hardest lesson learned: Don’t buy too much initially. It’s better to work in small batches, and much more cost efficient! What motivates you to keep going when things get tough? I really enjoy being a creative person and I need some type of outlet for my creativity. I will, in effect, always have a creative project, and I know that about myself, so that always keeps me going. What are you currently working on in the studio? Nothing at the moment, but I plan on finishing all of my keyhole pieces as soon as I get over this cold. How did you find out about Handmade in KC and what prompted you to join? The owners of Ugly Glass & Co. (a shop I use to vend at which has a lot of local vendors, I encourage you to check it out!) mentioned it several times, so I ended up looking into it, liking what I saw, and then I joined. Hopes/dreams/future plans? For the business, I hope to end up vending in a few more local shops, and hopefully I am able to be in a couple more successful craft shows, but I am keeping it small. In the near future for me personally, I am getting married in October 2017 and have plans on buying a house with my future husband, John.